It’s a Love Affair..! We Know Your Love for BMW..! 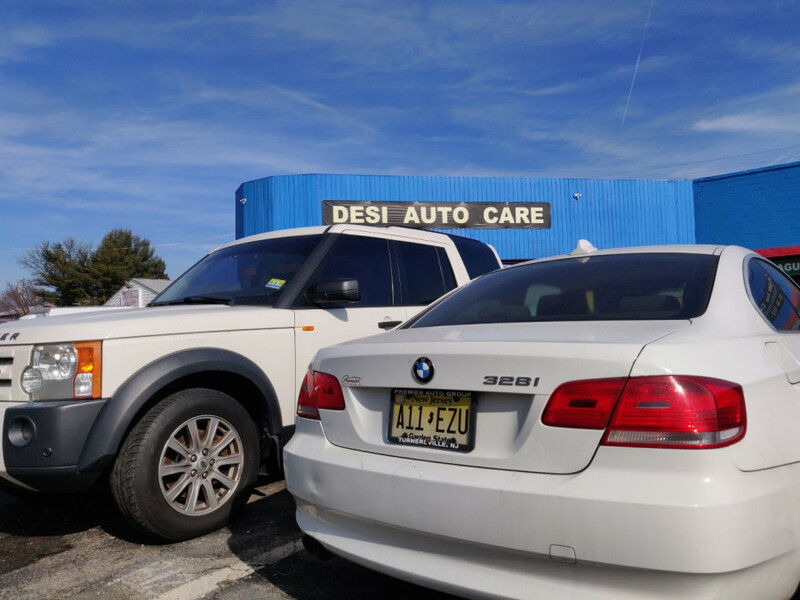 Desi Auto Care is a full service BMW specialized repair and service center in Stratford, NJ. 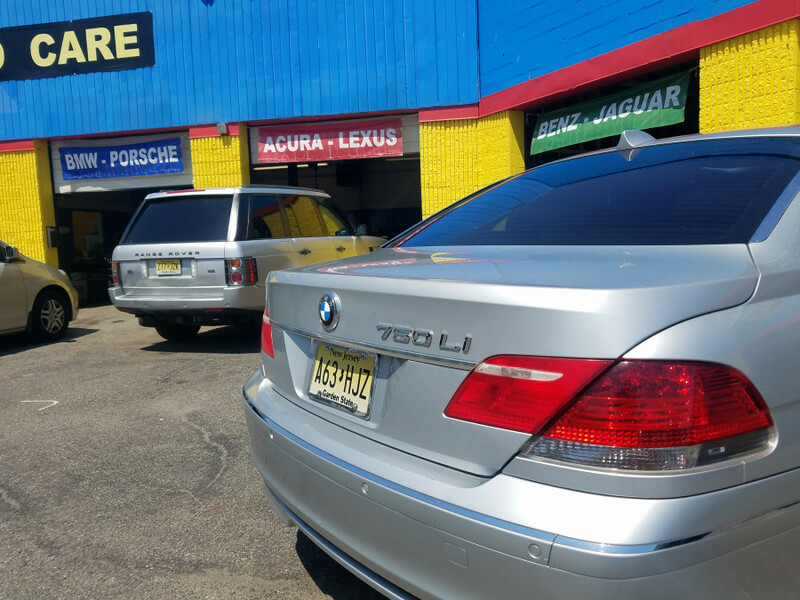 (Serving South Jersey, Philadelphia and Delaware) We bring over 30 years of German automotive experience and technical expertise. We’re team of BMW factory trained specialists with dealer level expertise. 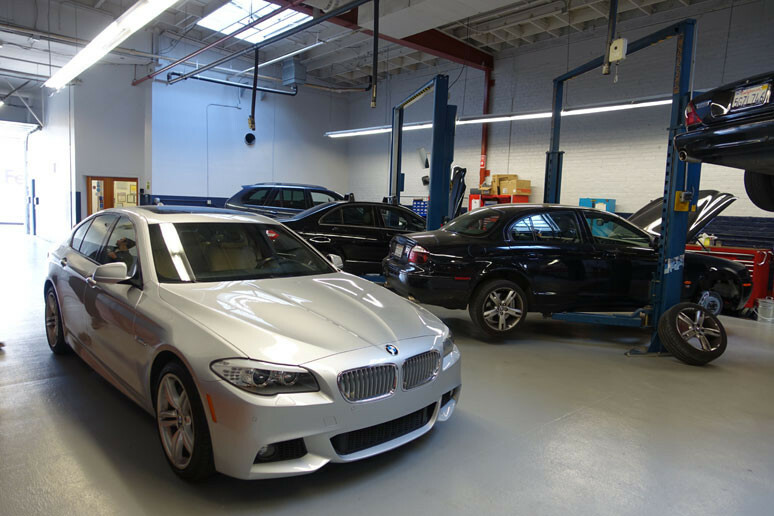 We have the experience, resources and knowledge to meet all your BMW repair and service needs. Your work will be done at a REASONABLE cost. We will not perform any repair work without your prior authorization. No hidden cost. 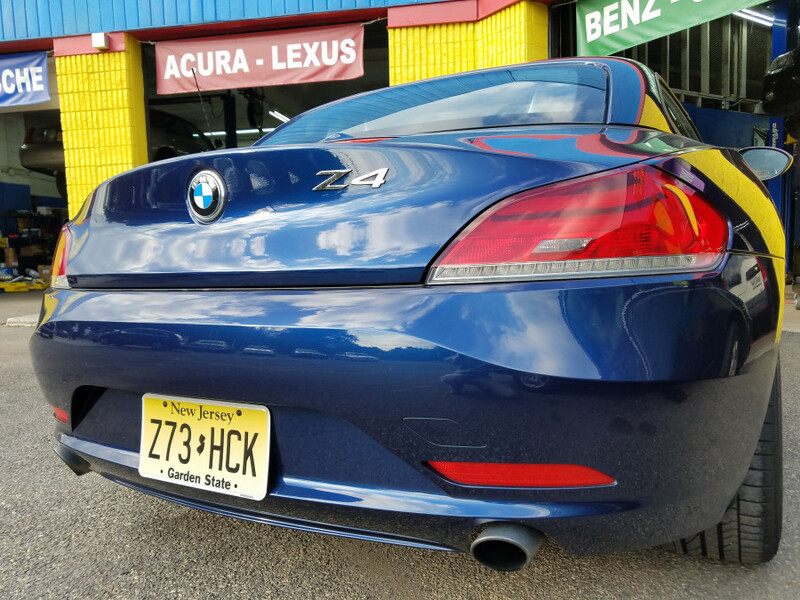 We take pride in our personal service to our customers and their BMWs. We’re proud to be a Female Friendly repair shop. Your satisfaction is our top priority. Experience the difference! Lead Master Technician Shawn McShea grew up with a extra ordinary talent for fixing cars and a passion for BMW. Shawn is the third generation of his technician family. Shawn has more than thirty years experience of GERMAN, EUROPEAN and JAPANESE auto repair and maintenance. Shawn also has twelve years experience as a lead master technician at BMW and Mercedes-Benz dealerships. Shawn and his team of technicians continue to keep up-to-date with information on the latest models, tools and knowledge to service your modern BMW. My car wasn’t shifting right because of vacuum leak and transmission mount needed to be replaced, after estimate, I approved the repair. It’s been shifting smoothly and properly ever since. Anyone with mechanical background will know that Sean is a gem of German auto repairs. Thank you for sharing your experience. We appreciate your support. Best wishes from - BMW specialist independent, local auto repair shop, German expert, certified mechanics, imported maintenance service center. This weekend I drove a convertible then I ran it out of gas. The following day, after fueling it, it died on me. 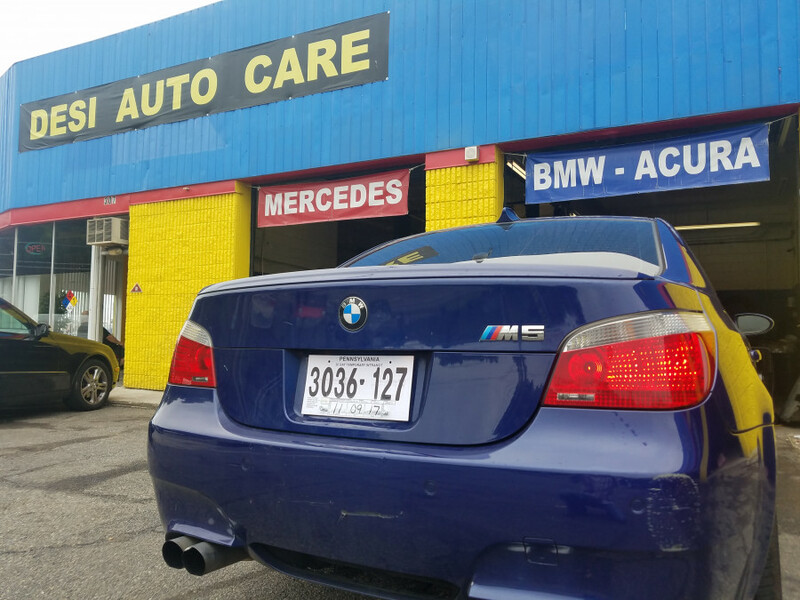 I found Desi Auto Care near my office in Stratford and let me tell you Shawn fixed the root cause of problems and saved me money. He is flexible and accommodating with your schedule. Plus does not try to create problems where they don't exists. I'd trust him with my lovely BMW. We love to save you money. Thank you. Desi Auto care came in $64 UNDER the estimate, got me right in (with an appointment) and took only 2.5 hours to fix my BMW. Amazingly fast and friendly. Saved my life in a bad situation. I'm from out of town-Absecon and they made it so I could get home without having to be stuck here in weekend. We welcomes you to our BMW-family of fine customers. Thank you. My car shook when I applied the brakes at high speeds. I came in at 8:25am I was out by 10am. My front rotors where replaced. i tested the car on the NJ Turnpike, the problem is fixed. quality of service is reflected in the correction of the problem. My old mechanic had struggled to diagnose this issue. Desi has too much business for its size. Although I did not have repairs done I did bring in a car to have it gone over prior to purchasing from a used car dealer. Andrew thoroughly checked out the car and then went over with me not only the small things he found but also used his vast BMW-knowledge to show me things to watch for in the future. Shop is clean by the amount of cars in for service. I took my car here -it was vibrating when I went over 55 mph. As a young chick it can be intimidating to go into an German auto repair shop alone. But Shawn treated me with respect and did not try to talk to me into any unnecessary repairs. He gave me two price options for an axle that needed repairing and the oil change was cheaper than the Turnersville dealer. We welcomes you to our BMW-family of fine customers. Thank you for your comments. Great place for your European car service needs. I did not have an appointment and Leslie fit me in because I was having hospital emergency for my mother-in-law. Needed a Motor Mount replacement and Spark Plugs. They have a human touch!! I have taken my BMW there for minor and major repair work, where else can you go that offers snacks/beverages complimentary while you wait. Recently returned Saturday to Desi Auto Care for transmission flush. Sam assured me that YES, my car would be ready same day and it was. Thank you for your comments. It's our duty to complete job on time. BMW-man Shawn gets straight to the point. I won't go into details on what was repaired on my car, but I will say that the error messages and SES lights that I had a issues with on my dashboard are no longer showing up and car drives and brakes smoothly again. He found what was triggering the message and found a couple lean codes. Made an appointment to have my BMW 328i looked at for strange noise under the engine and it was repaired that same day (also replaced new water pump) - parts came in while we waited. Office manager Rachel and technicians are extremely accommodating. Desi Auto Care will bring you back from the edge of insanity in the face of overwhelming odds with the European car that gives you trouble. Woohoo!! That is the word! 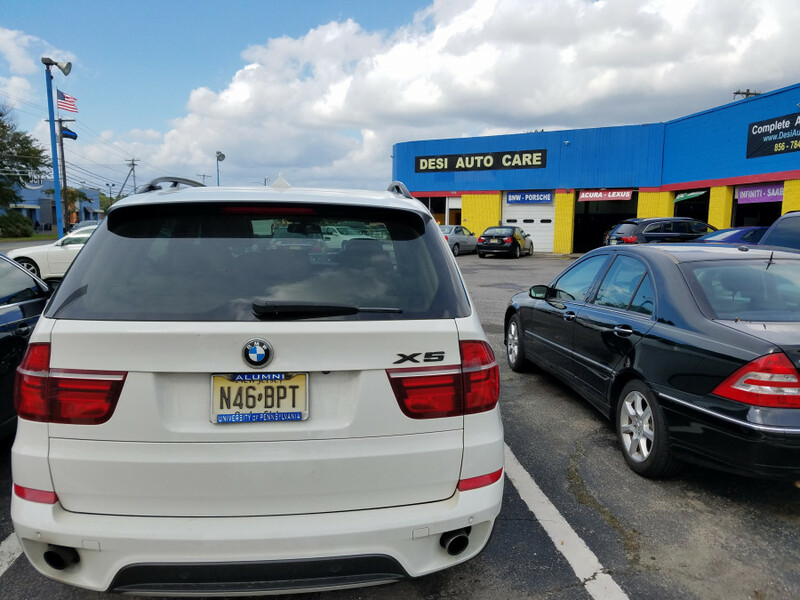 Ryan at Desi Auto Care really helped me out on last Friday going out of his way to fix my BMW X5 E53 air suspension problem (Self-Level Suspension, BMW is sitting lower than average) the day before leaving for a 800 mile road trip. Every time I have dealt with them they have been honest and no nonsense. They will be getting a lot more of my business. When last month my car light came on for some coolant issues, Sam took me in right away and fixed the problem, also replaced my rear light all under $70! This week my BMW back tires area was squeaking. $95 was my bill and my ball joint things were fixed. 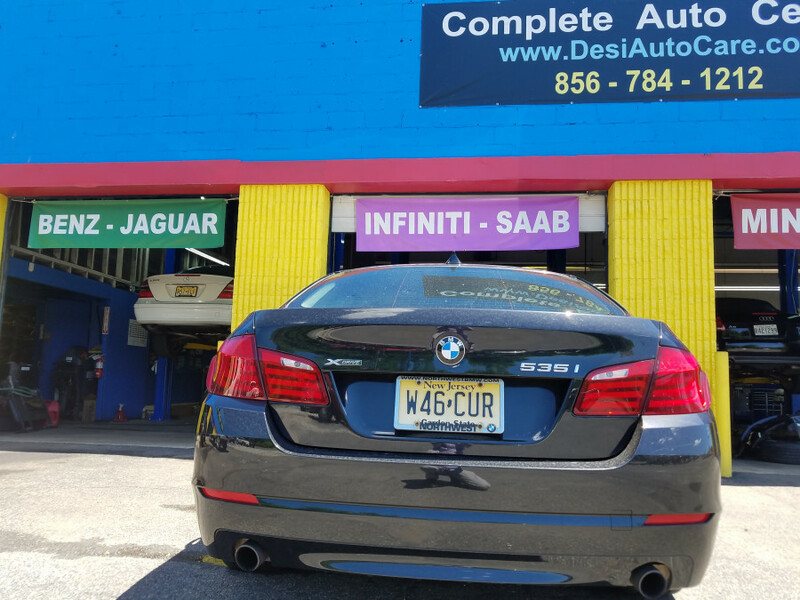 If you are a woman needing great ethical mechanics, Desi Auto Care should be your go to. 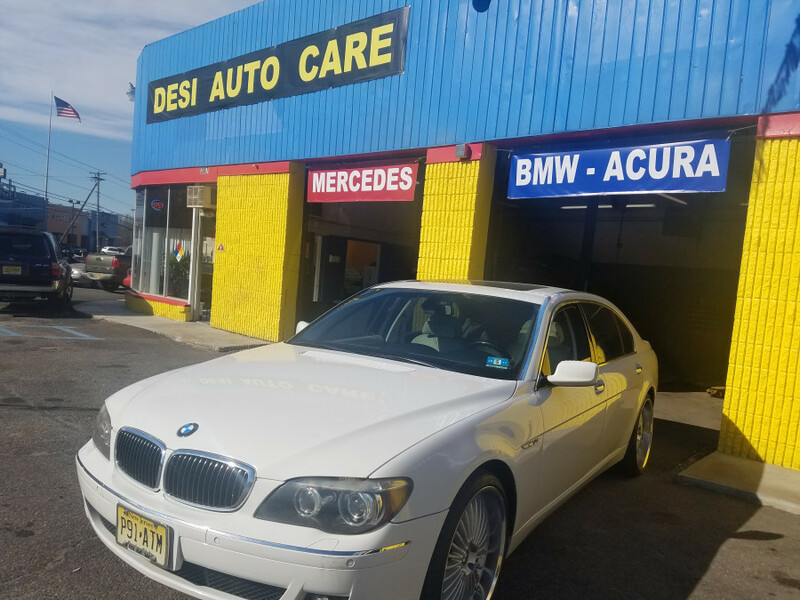 We have used Desi Auto Care twice for our Bimmer. 1st time was back in April 2018 when it started hemorrhaging coolant. We were new to area and didn't want to take the car to dealer. The 2nd time was for a routine maintenance and diagnostics in Nov 2018. Sean is very knowledgeable of Bimmers. Before this he was the top technician at BMW dealership. We appreciate your continue... support. Thank you. Desi Auto Care was very busy when I arrived and it took a little time to get the ball rolling but I thought that was OK. Leslie communicated well and was clearly working to fit everyone into the garage's schedule. Once it was test-driven and the car was elevated, Chris pointed out old parts that he thought needed replacement. I thought they were reasonable repairs, and he said he would start with the small/simple approach to address our acceleration problems before trying anything more involved (or expensive). A side note, charges were fair, so I was quite pleased! Folks! If you have BMW, or Benz. Desi Auto Care is the only shop to go. I shied away for years fearing that they would be way expensive due, mostly, to their reputation. Once I started to work with Shaun and team, I realized there are none better, nor any other who cares for the customers like them. It actually directed me to buy a BMW just so that I can keep it in their wheelhouse. Sam at Desi Auto Care was very up-front and professional. This is my 1st German car and now it feels exceptionally comfortable that I have found a reliable (on time service) BMW expert mechanics in my neighborhood. Went in for an oil change and door lock issue it's completed in 50 minutes, and out the door with the total he disclosed over the phone. We welcomes you to our BMW-family of fine customers. Thank you very much. Stand up mechanics from start to finish. Car disabled due to crankcase hose and vacuum system failure. I called a few shops including a dealer and none were interested in helping arrange a tow, sort it yourself and call us back. Called Desi Auto Care and Rachel sent a trusted towing guy to my home and Bing-bang-bosh. Car was with them in an hour and fixed by the evening. Exactly what is said on their tag line "There is only one boss - The customer! They just billed me for everything including the tow. Simple and Effortless, the way I want it. My BMW who is coming on 12 years old (read menopause years). 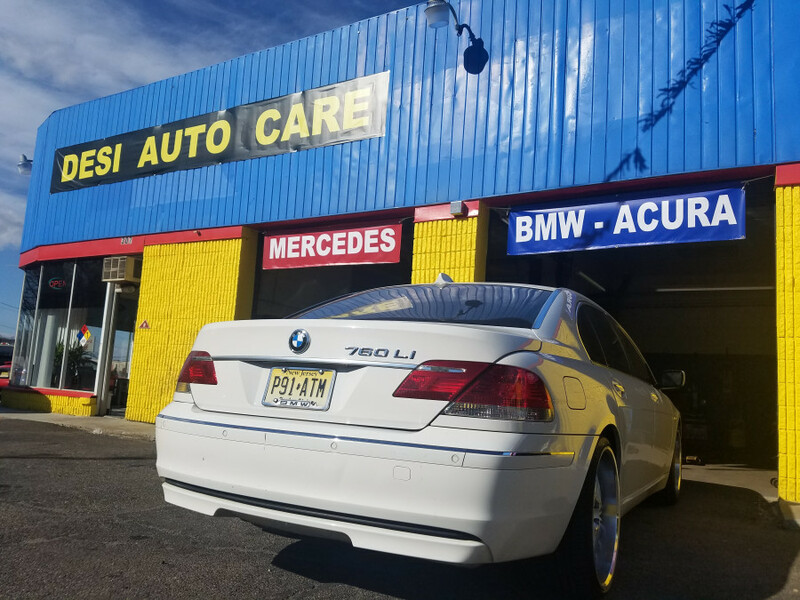 Desi Auto Care had done needed fixes and replacements. They’ve done everything from oil changes, replacing control arms, and recently my alternator. Each time I’ve satisfied that my car was fixed appropriately and I was treated with honesty. This is a shop you will walk away with a little more dough in your pocket than you otherwise would. Go talk to Shawn or Ryan. Don’t say I never did anything for BMW owners! We appreciate your support. Thank you very much. Chris was very helpful! My daughter was trying to get her car's air emissions checked and the gas tank cover was stuck and would not open. (Of course! it was the last day before the sticker expired) We just swung in and he came out and worked at it and was finally able to get it open. Just did it out of the goodness of his hearts on a rainy day and when we were in a pinch! I recommend Desi Auto Care. Your satisfaction is our top priority. Thank you. I found my go-to shop! My window regulator became dead and the window was stuck open...while it was heavy raining outside. Sean was able to get me in and out in less than an hour and was very friendly to work with. He used to work at BMW dealership (He is the BMW expert!) and explained everything before completing the car repair. I will definitely be coming back to Sean at Desi Auto Care as needed. I appreciate the way I was taken care of. Desi Auto Care really helped us (on Saturday staying very late) going out of their way to fix a suspension problem the day before leaving for a 1200 miles family road trip to Mississippi. Every time we have dealt with them they have been honest and no-nonse. They already are getting a more business from our friends and employees from our construction company in Washington Township. Yes! We get so many of your friends and employees coming to us for car services. Thank you. We appreciate your support. We're proud to be a female friendly auto repair shop. Thank you for extra bonus - my repair came with a 2 years parts-labor warranty. Shaun show me with tunnel camera where the transmission fluid leak was coming from and fixed the problem next day for a fraction of what BMW quoted me. He explained maintenance problems that if go unfixed, could lead to a more costly repair down the road. He hooked up the diagnostic computer and found a bad o2 sensor which was causing a rough idle. He replaced that and now my baby runs....wow!! 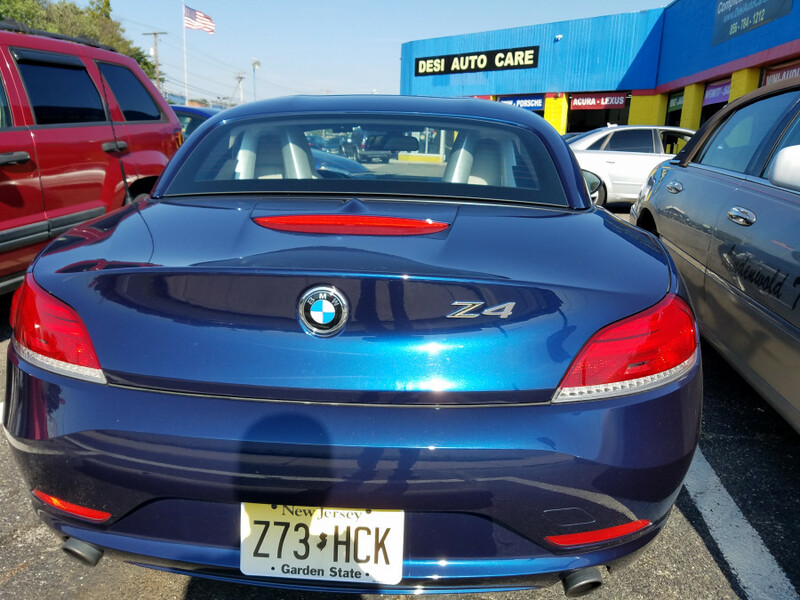 I will be back for my BMW and Benz repairs and preventive maintenance needs. 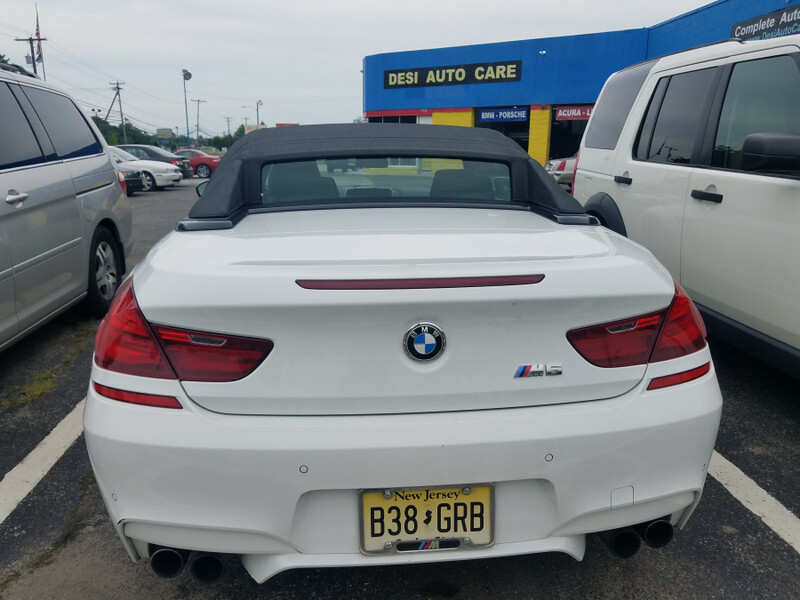 Took BMW in for replacement of both front and rear axle, front left CV boot, and four new tires as recommended by Mount Laurel dealership back in June. My car was evaluated by Shawn at Desi Auto Care and services were not needed at the moment. He advised me how to determine when the replacement is needed and how many more miles before new tires are needed. TRUST SEAL approved by me! 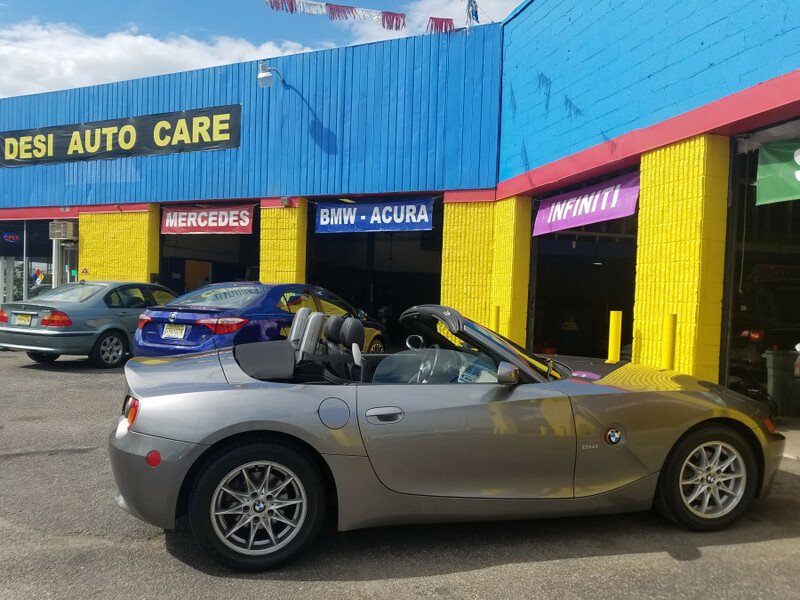 It was a pleasure taking care of your BMW. We appreciate your support. Desi Auto Care is second to none! We appreciate you for coming from far away. Thank you very much for your support. Desi Auto Care's Rt. 30 location is not far from my home. I chose to wait for my BMW oil change service and they had it done in 45 minutes, which I appreciated. Waiting room is full with free snacks, drinks, coffee and no frills, but it is nice and clean. Andrew also turned off a tire pressure warning light that other mechanic hadn't been able to figure out how to get off, and Andrew didn't even bill me for it or anything! 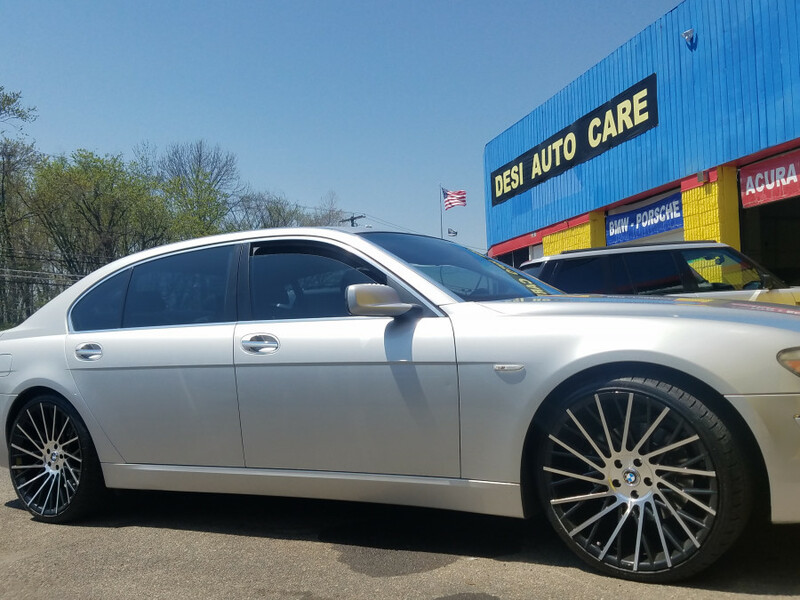 His oil change on the 6-Series is cheaper than any other German shop. It was a pleasure taking care of your car. Thank you very much. Had an issue where BMW would not start. 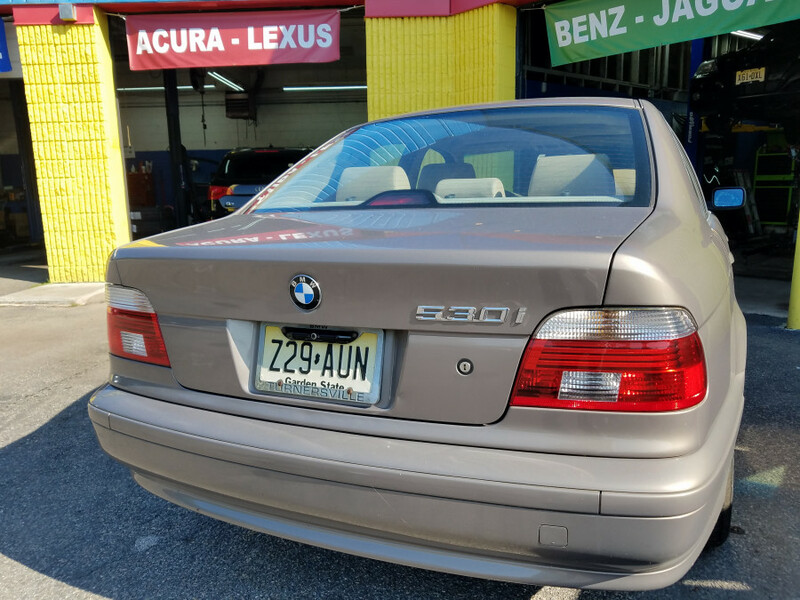 The shop in Bordentown that "supposedly" also "specialized" on Bimmers told me that it is my crank sensor, and even told me that my self installed HID and is giving false reading. So, of course I paid them to fix it even removed the HID I installed. After 4 days, it happened again and even stalled me on NJ TPK 95 near exit 32. Had it towed to Desi Auto care and Andrew already knew it was my fuel pump. I approved the job and currently I'm happily driving in NY without any issues. Glad to hear that you're happily in NY. Thank you. After getting numerous astronomical quotes and crazy hours in labor, I was referred to Desi Auto Care in Stratford by my nephew-jimmy. We took our BMW here to have the clutch replaced and power steering issue. Pricing was more than fair and he was fast. Sam was easy to do business with. The BEST service experience ever! They're highly skilled in servicing BMWs and value your relationship with them. We appreciate your support and please say thanks to your nephew-Jimmy. Not only did Desi Auto Care in Stratford replace the wrong oil pan plug (installed by my previous mechanic) with the correct one, they re-threaded the pain and lined it so it wouldn't corrode/leak/crack, or cause any other problems. Thank heavens! They also diagnosed complicated electrical problem ( I was avoiding from long time) you get an honest assessment of your BMW's needs. They will learn my repeat business! It was a pleasure taking care of your car. I went in for a repair that required the complete disassembly of my gear shift. I had an appointment but allocated extra time in my schedule for delays. Still, while Sean had been working on an Audi when I arrived he finished that job and began mine within 10 minutes of my appointment and had me driving out the door on time. Not only had he done the job I came for he but fixed a burned out light I had and added a small cosmetic fix. It's an essay finding the shop, if you are going on White Horse Pike. 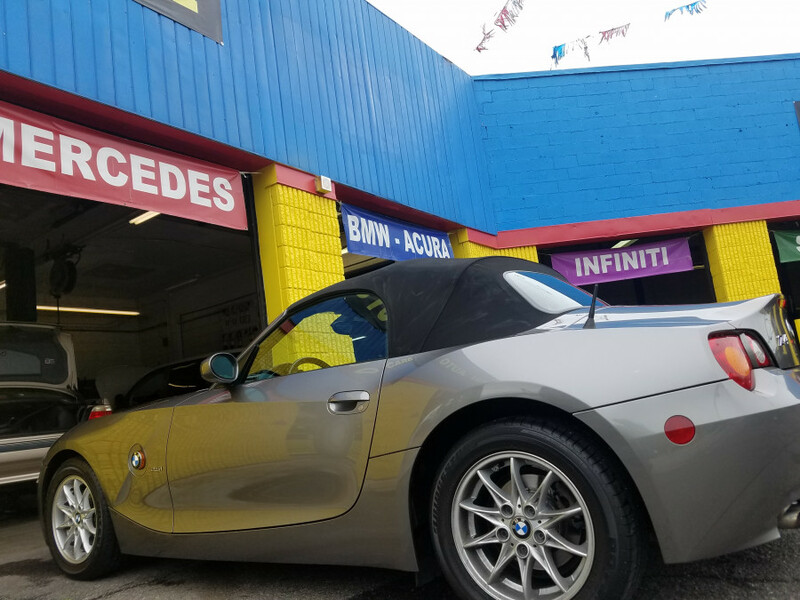 The shop is bright yellow & blue across the Posh Car Wash.
Best wishes from - BMW specialist independent, local auto repair shop, German British European expert, certified mechanics, imported cars maintenance service center. I brought my car for estimate to troubleshoot rolling idle problems + replace all the belts + pump + fan....It was diagnosed by Ryan that the idle control valve was out of range and needs to be replaced. I was quoted fair and he can install in about 30 minutes. Also I was quoted for the belts, timing, water pump, fan clutch and fan. After having a conversation with him, I realized that this is a time consuming repair but team Desi completed repair in about 5 hrs. I do recommend. 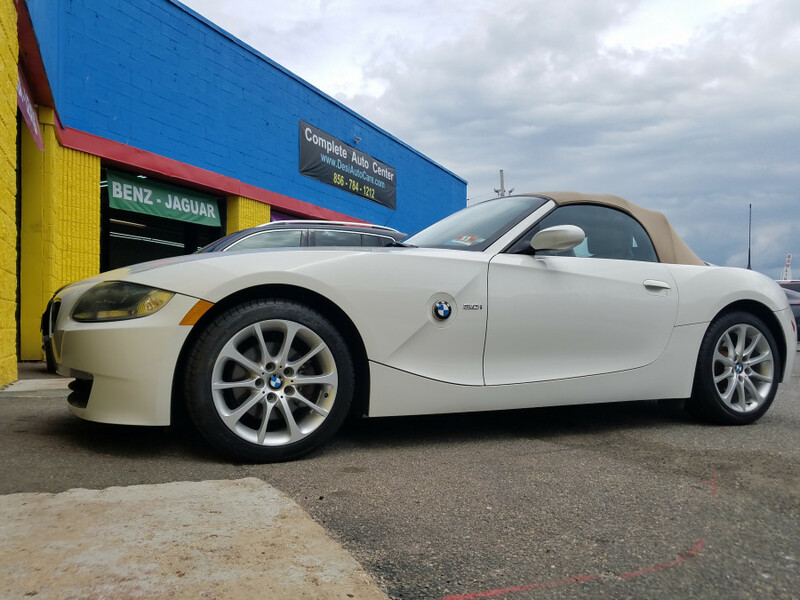 According to BMW specialist Ryan, engine coolant leak was developing from the expansion tank resulting in engine overheating. Overheating can cause severe engine damage. Because of cooling system component fails, he inspected the entire cooling system. I know it's not uncommon to find additional component have failed or are leaking. He was honest and told me there was no additional leak or failure. Cheap prices and car was back to me on time as promised. We welcomes you to our BMW-family of fine customers. BMW dealer sold me used 143,000 miles "AS IS" The suspension was rough and grinding from underneath the car, when I turn left, and at 35 miles speed. I return to the dealer and they couldn't make a diagnosis, so service advisor told me the driving is "fine" and the noise is "normal operating variant noise". From the advice of my uncle, I took the car to Drew. He told me the tires were a bad choice for an M5 and the noise was coming from the differential. There was apparently a BMW bulletin about the differential fluid that the dealer missed it. He changed the tires to Continental and changed the differential fluid with Red Line and miracle! The noise is gone and the riding is smooth like a silk. Drew is very brilliant and honest to a fault. We appreciate you for sharing your experience. Thank you very much. My wife’s car having electrical issues and keep dying every morning even though we replaced the battery three weeks before. Shop in East Berlin couldn’t identify the issue and hold the car for five days. Eventually we brought to Desi and later on during electrical testing, Shawn found the issue with the back of the radio. It wasn’t performing well and draining the battery overnight. Shawn call us to the garage bay and shows on diagnostic meter that the car is keeps draining power even though car is off. Feels so relax now! We appreciate his help. We welcomes you to our BMW-Family of fine customers. It was a nice fun talk with you guys. Best wishes from - BMW Specialist Independent, local Auto Repair Shop and German Expert, Certified Mechanic, Important Maintenance Service Center. When I hear dull sound like pieces of metal striking together in rear end. I brought my one and only car to Desi Auto Care. Michael's work consciencetiousness to find the problem and when he found out it was the rear differential, he found me a good price on parts and installed it professionally and now my car runs great. I appreciate Michael and helping me get the job done right and on time. I'll not take my BMW to anywhere else. Best wishes from - BMW Specialist Independent - Local Auto Repair Shop and German Imported Expert, Certified Mechanic, Maintenance Service Center. My Bimmer needed so much work to be done. List: Ball joints, oil valve, timing belt, hoses, brake pads-rotors and more. Sam and Shaun were so friendly; Rachael even drops me to my work place in Somerdale. The price was almost a third of what I was given estimates at two other BMW mechanics, and he took the time to educate my dumb questions on what I need to do for future maintenance. This work quality and customer satisfaction can't be beat in South Jersey. It's our job to answer every question you may have. I brought my lovely red X5 here bcos wouldn't start. After 3 days of frustration on their part, they found out my son had left his iPad adapter plugged in back seat outlet. (Plz accept my apology) This kept draining the battery when we tried to start the car. I can imagine if the problem was easier to find, but the plug was hidden in the back seat. Michael had manually deciphered the computer code to locate the problem. So, how much was I charged for 3 days of work? Zero. We love to solve unique problems. I almost reach to my work place and seen my LOW COOLANT sign came on. This means I'm out of coolant and the BMW dealership was 15 miles away. 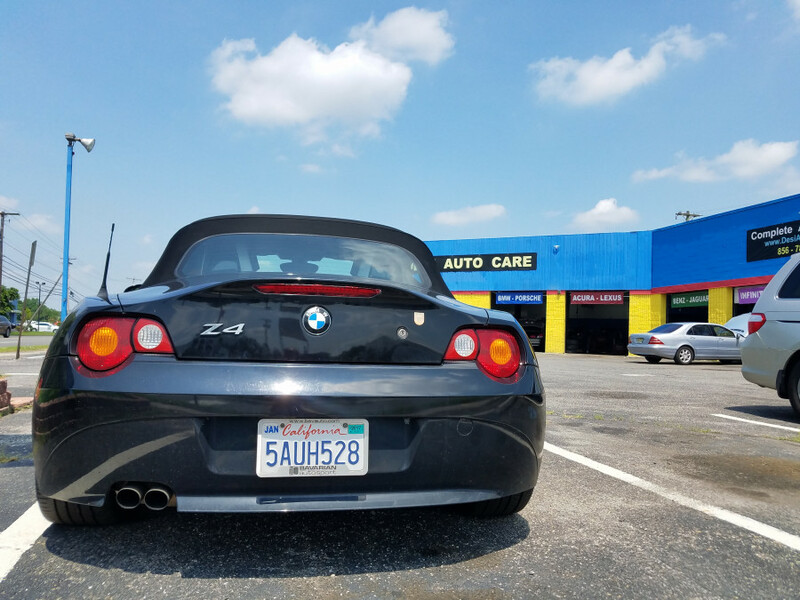 On my lunch break I decided to go to the nearest BMW mechanic shop (Desi Auto Care) to get the coolant fill-up, so my engine doesn't overheat. I explained my situation to mechanic; he grabbed a coolant container and walked in a parking lot, topped me off and gave me his business card. Now this is not my regular mechanic shop but I was treated like a regular customer! I'm a chick and I felt comfortable coming here. Best wishes from - BMW Specialist Imported Auto Repair Shop and German Expert, Certified Mechanic, Maintenance Service Center. This team was great and sorted through the issue, even staying late on a Friday so I'd have a car on the weekend. I brought my Bimmer here because my step brother advise me. I live in northern NJ so it was a bit of a drive but it was worth it. The problem that I had was with the passenger seat, it went off the rails. Mike diagnosed the problem quickly and made it clear that the problem was actually with the steel cable that the motor turns. Techs were very friendly and generous with their time and advice. There are 100's of mechanics between my home and Desi Auto Care but I'll only chose Desi. We appreciate you coming from far away. My 2009 BMW died on me 10 days ago on the route 38. 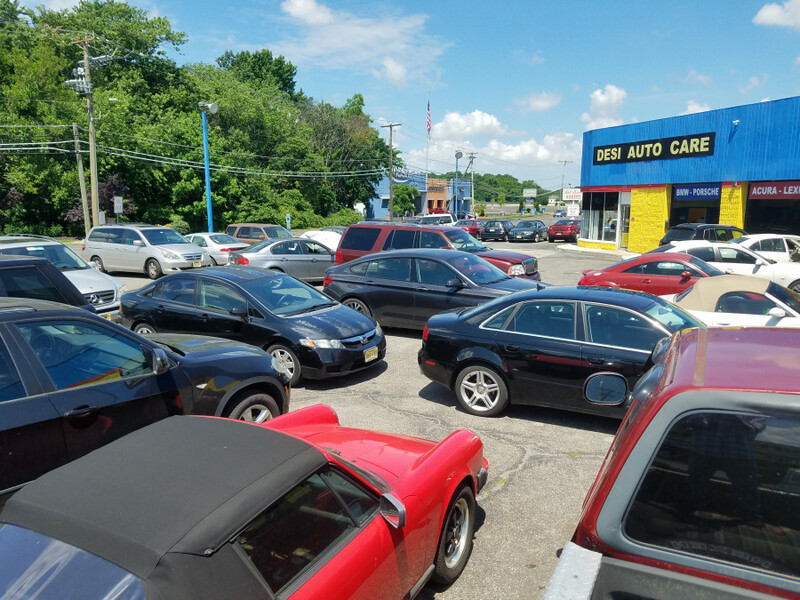 I towed to another shop in Maple Shade that did a sneaky job. the car was still leaking oil and squeaking like a stuck pig. I looked up reviews online and found this place. The dealership rips you off 90% of the time. 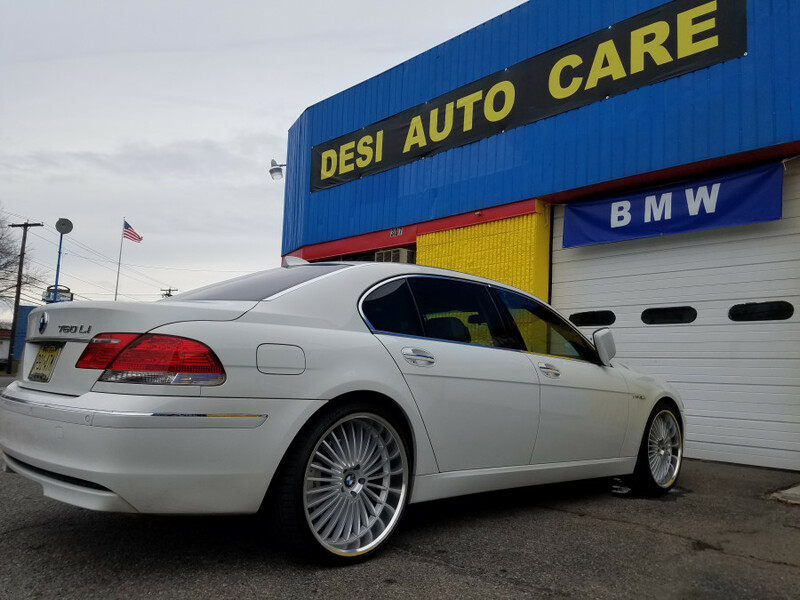 Desi Auto Care has low prices and you can depend that great BMW work is being done, they answers all your questions and treat you like a boss. You guys have a customer for life. Cheers! There is only one Boss - the customer! It was awesome experience! Brought in my 5 series with a sporadic issue that I was certain was going to cost me an arm and a leg. Shawn was honest and broke everything down for me. he suggested it was time to let the BMW go. The cost of the repair would have been too much and will not justify. Now I'm sitting pretty in a spiffy brand new 4 series with no complaints - so thanks Shawn for your honesty and candor. Hopefully don't have to meet you again anytime soon but if I do have any BMW issue ever_I will always come to DESI. Repaired the car the right way on the first try. Fixed the car in a timely manner, I highly recommend Desi auto . It was refreshing to go to a repair shop and feel comfortable afterwards , about the repair work. Also close to mass transits so a ride home was not an issue. Thank you from - BMW Specialist imported Auto Repair Shop and German Expert, certified Mechanic, Maintenance Service Center. With my family I was returning from a visit with our daughter in Philadelphia when catastrophe struck. My BMW decided to overheat - announced by a chorus of lights and buzzers. As we waited, Andrew did a great job of therapeutically explaining what the problem was, how they would correct it, how it came to pass and how to prevent it in the future. 5+ stars!! You're a guy with big heart. We appreciate your support. Thank you so much. Best wishes from - BMW Specialist imported Auto Repair Shop and German Expert, certified Mechanic Maintenance Service Center. It was a pleasure to talk to you that evening. Thank You from - BMW Specialist imported Auto Repair Shop and Expert European - certified Mechanic Maintenance Service Center. 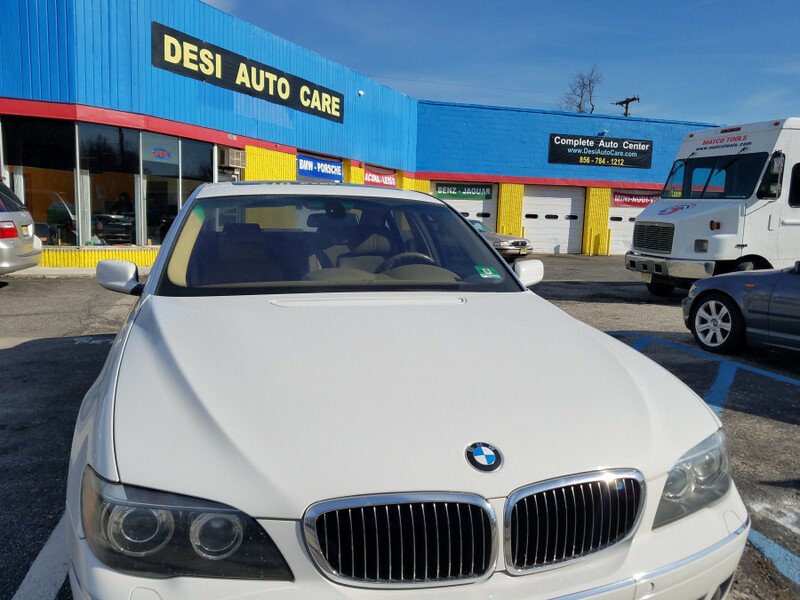 Once you have had service at DESI Auto Care you will leave your BMW dealer. Their honesty and work quality will make you and instant fan. Down 2 earth guys! I had a door that BMW wanted $745 to fix. Mike was able to adjust it in an hour at little charge. You should give them a shot not matter which German car you own. It was a simple fix. We're happy to save you money. Thank You from - BMW Specialist imported Auto Repair Shop and Expert German - certified Mechanic Maintenance Service Center. Neither window works up or down no noise at all when switch is pressed. Dealer diagnose this: the driver door module is bad, problem of wiring harness between the driver's door and chassis, and the body control module has failed, asking for serious money. I'm glad I got 2nd opinion. Desi auto care resolve problem by replacing two fuses F46 and F41, cost me almost nothing. These mechanics are Bimmer lovers. We appreciate your comment - Yes! we're BMW lovers. Thank you from - BMW Specialist imported Auto Repair Shop and Expert German certified Mechanic Maintenance Service Center. Honest, well-priced service! Once I came here for failed thermostat resulting in engine overheating/illumination of the check engine light. Did replacement the thermostat along with a complete inspection of the cooling system to correct this concern. I'm so glad I found them because working with BMW dealer is a nightmare! This time Desi's BMW technician even gave me instructions over the phone on how to change the battery in my keyless entry remote when dealer wanted my VIN number just to let me know if it was possible to change the battery. We believe in personalized service, simple problems like this should be taken care over the phone, we love to save you time and money. Thank you from - BMW expert specialist imported auto repair shop and German mechanic maintenance service center. I've had a good BMW experience with these guys. Brought in my M3 telling them I was pretty sure the power steering pump had failed and they needed to replace it (about $900 job). They could've easily taken advantage of me, leveraging my own assumptions against me, but they dealt with me honestly instead. 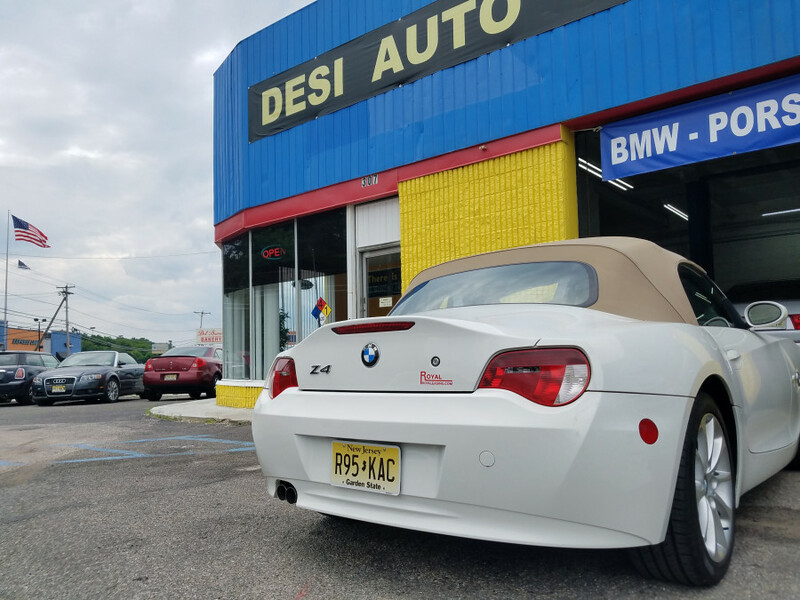 Their scheduling is prompt and efficient, I never worry or fret when I bring my car to Desi - there's a lot of value just in that! Yours was a simple fix. We love to save you money. Thank you from - BMW specialist imported auto repair shop and mechanic maintenance service center. Awesome service by Desi Auto Care. On a road trip to Atcantic City and the radiator on my BMW takes a dump! Having no idea where to take it, I'm so happy that I have found Desi Auto Care. They got me in and out the same day with no B.S. and on the road again at a reasonable rate. Close to Philadelphia as well. Thanks! Thank you from - BMW specialist auto repair shop & maintenance expert mechanic service center. 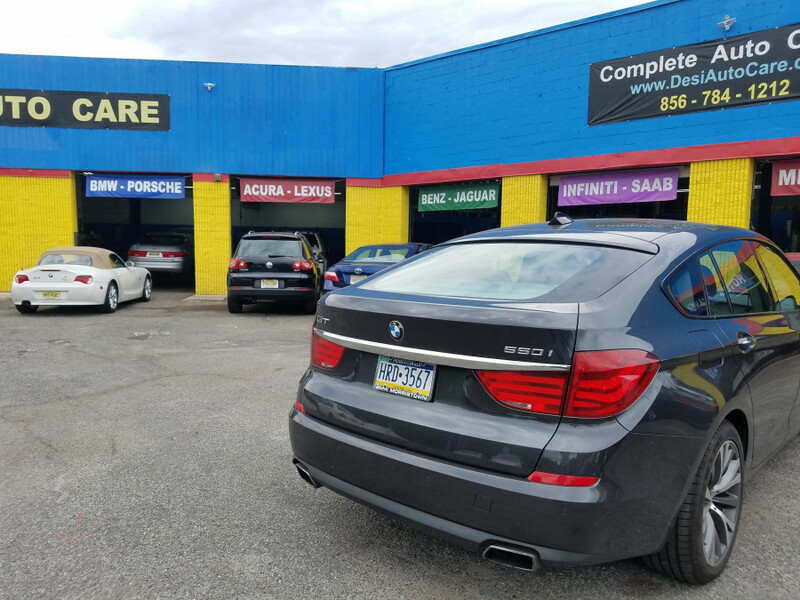 Union Park BMW Wilmington, Delaware wanted to charge me $1000 for new transmission connector sleeve, They also wanted to charge me $300 for cabin filter and oil change. Plus I have to listen to BMW's continual BS and satisfaction survey harassment. 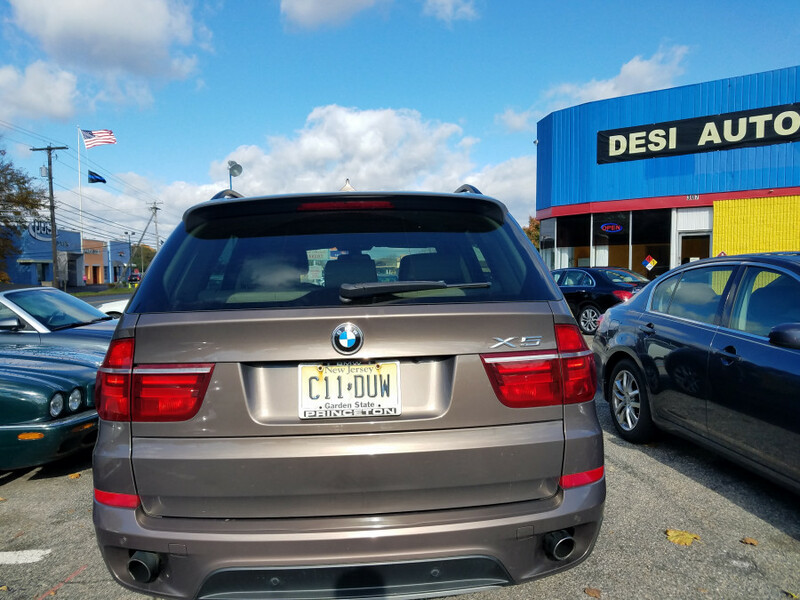 So I took my car to Desi Auto Care, a very well-known BMW specialist shop in New Jersey. The new transmission connector sleeve and the cabin filter and oil change (Shawn the great guy!) He charged me total $428. From my home in Delaware to Desi Auto Care is 90 minutes one way, but who cares? I will drive happily to this honest shop. Genuine shop for BMW lovers! We appreciate your long travel to our shop, You have been great Customer. 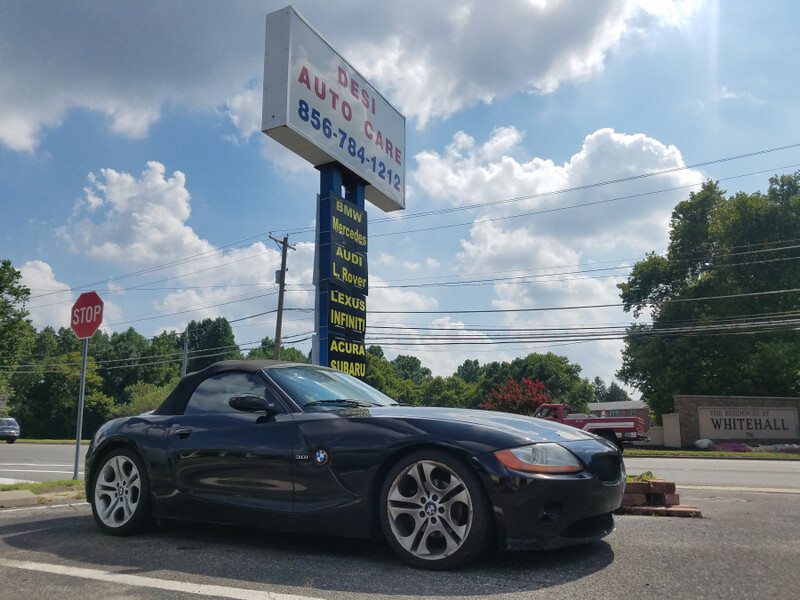 My BMW was making disturbing noises under the drivers seat so i dropped it off with another auto shop earlier last week. I chose them based on location, within walking distance of my work place in Collingswood. I was told it would cost over $1700 replacing the strut mounts and one strut ($820), sway bar end links and bushings ($430), the steering shaft ($452) I absolutely could not afford that. They charged me $185 for the estimate. Based on a referral from a librarian woman from my hometown library, I called Desi Auto. I told them what the problem was and what had been recommended to me. Later on I spoke with Andrew and he said they had tried to "shotgun" the problem - replacing everything in the area and hoping the problem stopped. Eventually they diagnosed the noise and fixed the problem all for $280 with warranty. We're proud to save you big bucks. Thank you for giving us opportunity. Best wishes from - BMW specialist repair shop, expert mechanic maintenance service center. My car died on the route 30 in Berlin and this was the only BMW shop in are. They offered to stay late after closing until I could get my car towed to their shop. My car stayed in their shop overnight until they could get to it next day they called me to tell what was wrong with it. I didn't end up having my BMW fixed because they told me not to spend any more money, car is too old. Major expense to repair, but they are very courteous and go out of their way. Gave me clear opinion. We're very sorry to hear your Bye...Bye...Bimmer! It's our job to give HONEST opinion only. We brought a BMW-M3 here that my son wanted to purchase. These guys really know what they're doing. They found so much wrong with the car and advised us not to buy it. They were patient with my son and explained all the details of what they found to him, pointing everything out. We trust then when it come to knowing Bimmers! We were very happy to do pre-purchase inspection for your college going son. Feels like a home with this people, i can leave my car, give him my credit card, go on business trip and feel reassured that Sam and his team will take care of everything and not take advantage by replacing just to replace. Have been to most of the so called BMW repair locations throughout the area and this place takes the PRIZE!! Pros_ Excellent service, willing to talk, only necessary repairs, fair prices, they treat women with respect! Cons_ No dealer amenities i.e. loaner cars, busy but at least they are honest on when they can actually get to your car. We feel proud to earn your trust about credit card & repair job. Thanks from - BMW repair shop, maintenance specialist, mechanic service center. I'm a old mechanic so I guess you could say I'm tough customer for these guys. I have to give them great credit since they put up with me and all my questions and persistence. 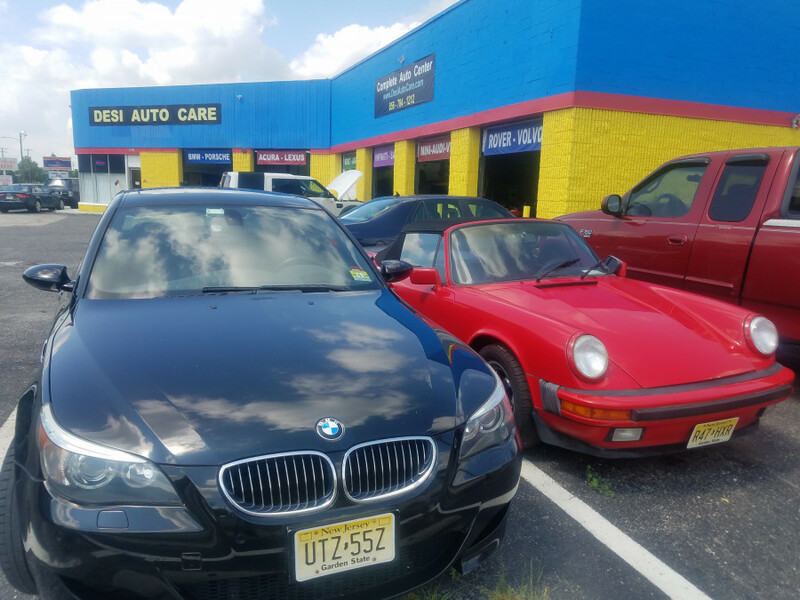 Desi auto care is perfect BMW repair shop , they treat me fair and professional- for that I'm customer for life. Wide variety of Free refreshment offered for customers. You have great sense of car repair, actually we learn few things from your experience being a mechanic. It was a good time talking to you about your special BMW. 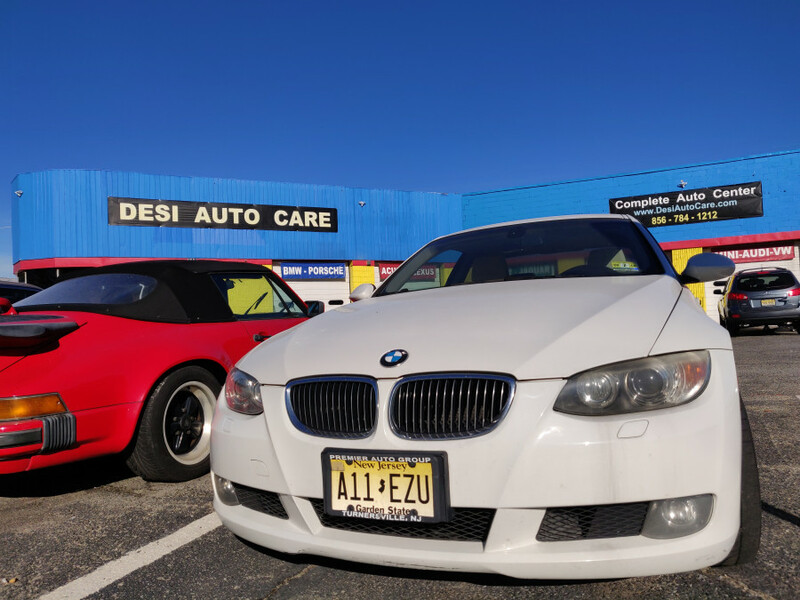 Desi Auto Care- Has been the best thing that happened to me! and for the love of my cars! BMW X5 4.8i and the Chrysler Concorde! Sam own's this enterprise and he deserves due respect for 1. Understanding the customer perspective. 2. Provide complete and thorough information from the Chief Mechanic to the customer (Transparent) 3. Go beyond and above with the customer expectation. Now all that said: A Big thumbs up for the Man behind the brilliance (Shawn McShea, Chief Mechanic/ Architect, I must say) he has complete end to end understanding of whats in a car! (especially the BMW & the European cars) . He really knows how to connect the dots to get to the root problem. Shawn clearly explains and knows what to fix by priority, Also lets you know if its worth your buck for the fix (investment) you are spending on the repair. Clearly I have a Lot of confidence in the work done on my car for a ton of Money I saved from going to the dealer. I surely know, Shawn has spent at least double the time I have been billed for the 1 thing that I had to go back to fix, which was not part of the initial problem. I think Sam, Shawn, Drew & Rachel do a great job! BMW, now drives like one! We appreciate your patience during repair, which took little bit extra time to finish. We apologies for delay. We're thankful to you for choosing us for both of your cars repair jobs. 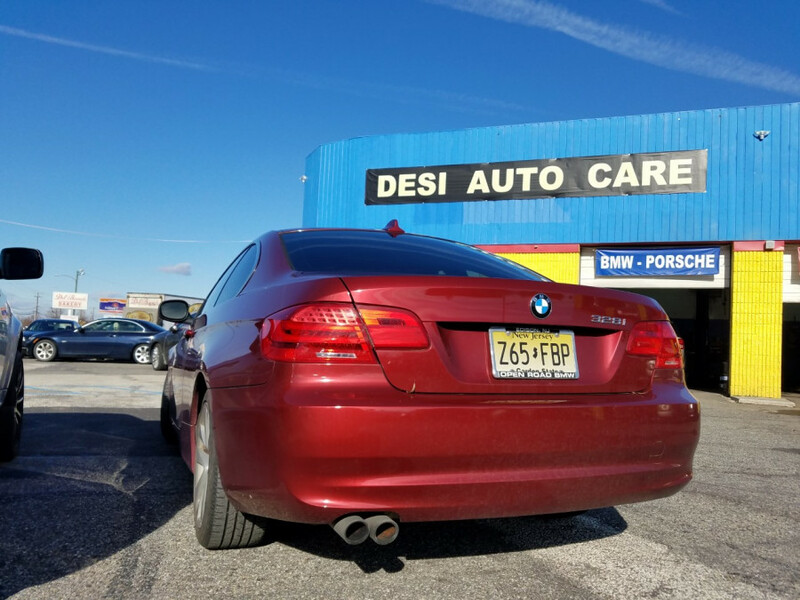 I stumbled upon Desi auto care just by looking up BMW repair shop. My BMW 750Li had an issue with a coolant vent design problem. Its our duty to explain the details of problems so you feel comfortable about repair job. And PLEASE DON'T PASS OUT...We're here to help. Thank you for giving us opportunity. you're one of the nicest customer we have. Are you a woman (or a man) who has felt little out of her element when she had to go to her mechanic? Are you tired of feeling vaguely screwed by your mechanic? And not in good way. Here is good news! The friendly folks at Desi Auto Care are here to ease your anxiety. My only car BMW broke down on sunday, when they were closed. Sweet girl Rachael returned my phone call 8am Monday to confirm , they could do work THAT DAY. 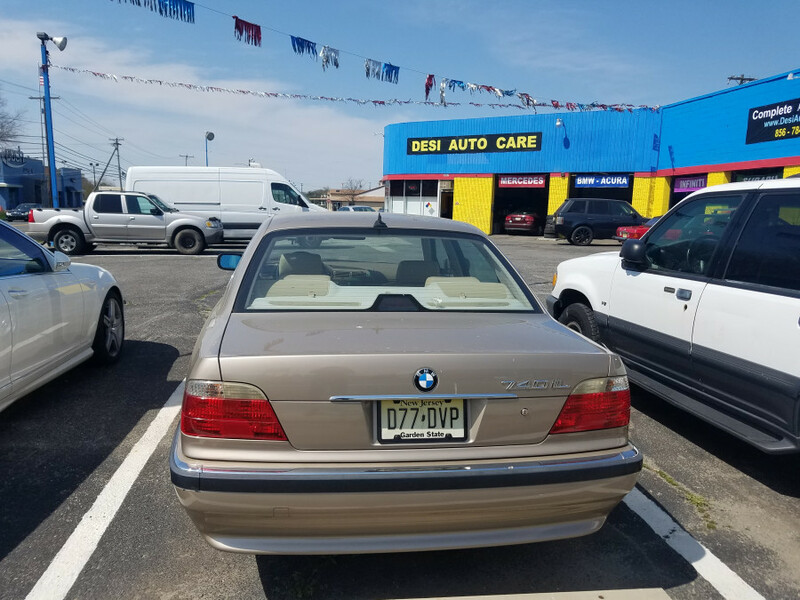 When I drove my ailing BMW into garage, I walked in on a conversation between the head mechanic and older woman getting ready to drive to her home in Philadelphia in her just repaired Mercedes-Benz. From the conversation, I gleaned two things: First, this woman loved them. Second, the head mechanic was a respectful man. I left my car there, and before noon they'd called me with a full breakdown of all that they'd found, what it would cost me and a promise they could be done by 7pm same day. It was fast, friendly and efficient experience . Can I get an amen? It's our duty to make sure you feel very comfortable in our business environment. People always describe us "Woman Friendly Auto Repair Shop"
we appreciate your super support!! My family and I were driving 02 BMW X5 recently where it quickly went from yellow overheating warning, to red, to limp mode where it refuses to drive. We ended up leaving it at Olive Garden parking lot and taking a taxi cab to home. We did a bit of research at home and other people who had similar problems needed their waterpumps and thermostat replaced for around $1k. We looked google and there were no auto care around our house that specialized in BMWs. So we decided to drop it off at desi auto care in Stratford (the closest and well rated on google etc) then deal with it tommorow. When we arrived(happy that the car made it so far!) the guy at the front desk hopped up, came to the car and took a look at it immediately. He was very friendly and showed us the possible causes for the problem. It was ready on Tuesday afternoon. It turned out that it was indeed the water pump and thermostat that needed replacement. A young girl at the front desk, also very friendly, showed me the old parts and told me that it very fairy common for X5 water pump to need replacement. The final total came to about $535 including tax, which was very lower than what I had expected. Overall: very friendly, very straight forward, and they did the work very quickly and well. We will be returning. Thanks for leaving a review. 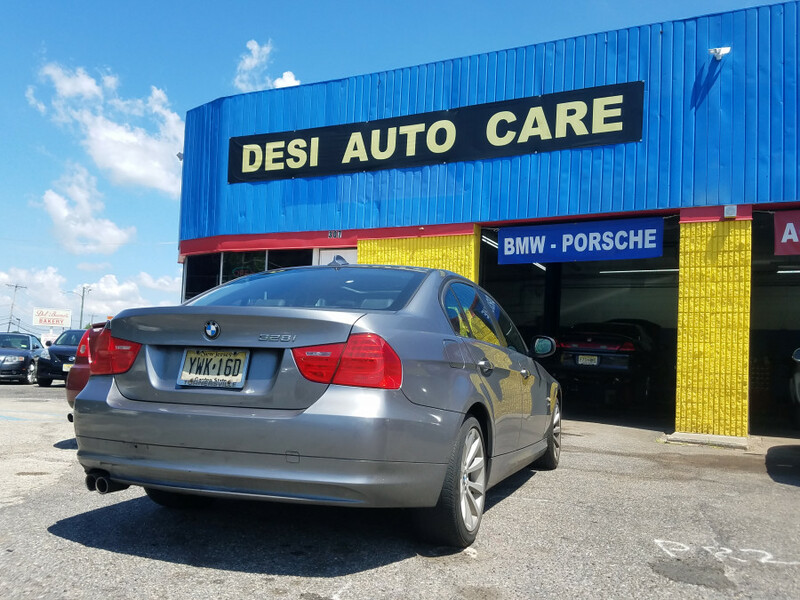 Our team at Desi Auto Care is thrilled to hear such good feedback, and we're proud to be the best BMW repair shop in South Jersey. You're sending your friend for BMW repair, tell her to use 10% off coupon for first time customer. Bye! Something happened under my car when I was close to Lindenwold Railway Station so I pulled in here and I was met at the door with a question asking me what happened? I've never had that before someone actually meeting me getting up from the desk? Thank you for that. My regular mechanic quoted me $1200 for struts in the near future but I decided to hold off on that unfortunately that is exactly what that sound was under my BMW but I didn't say anything to Desi Auto Care about it. I just let them fix it. It was $550, OMG. The significant price difference is not the only reason I give this place five stars, I like the way the employees explained everything to me it's very clear that they were not in this for a commission, they want to get the job done and get my car back on the road, I will not go anywhere else for my car needs. Bringing her back to have engine mount done in a few days. Thanks for leaving a review. It's our team's job to save you money. Thank you for setting up one more appointment with us. We'll be proud to serve you again! After Reading positive reviews, I drove from Atlantic city to get work done here. Its worth the drive to come this far. These people know BMW inside and out, love to talk about BMW's and receptionist was so warm and welcoming. 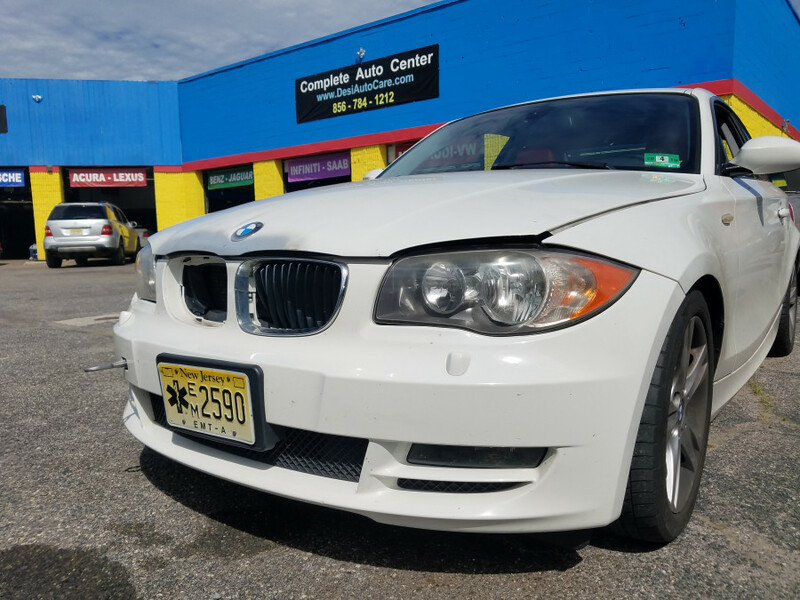 Did fix my headlights electrical issue, replace rear brakes plus a brake fluid flush and coolant flush on my '08 535xi'. I've saved atleast 50% compare to dealer price. I've interacted with Shawn, Drew amd Sam. These guys are awesome- very patient, very customer oriented..... Just wish this shop was closer. Thank you for your comments Nicholas. Our team is thrilled that your experience was a positive one and we're looking forward to seeing you as a our regular customer family. Valve Gasket leak on my BMW had sidelined my summer. 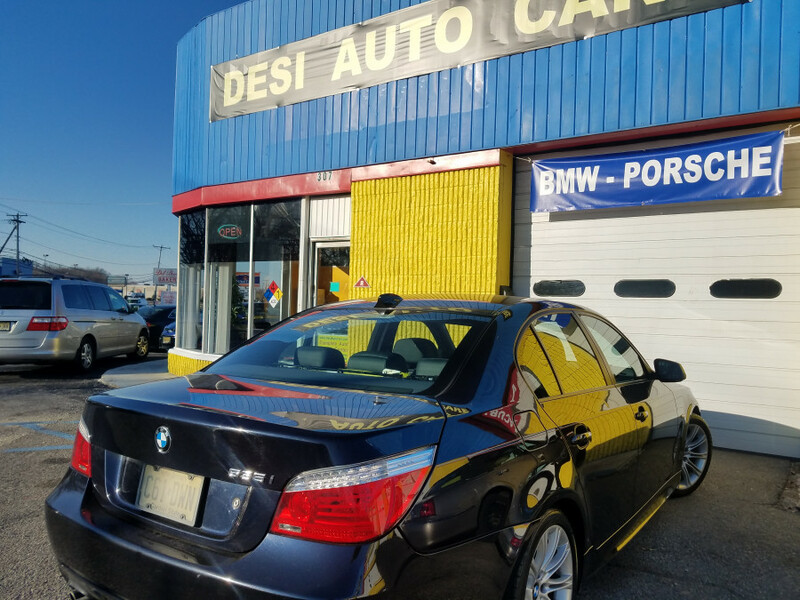 My experience with the dealer wasn't amazing and was looking for a place who would fix my car for reasonable amount then, my friend told me about Desi Auto. 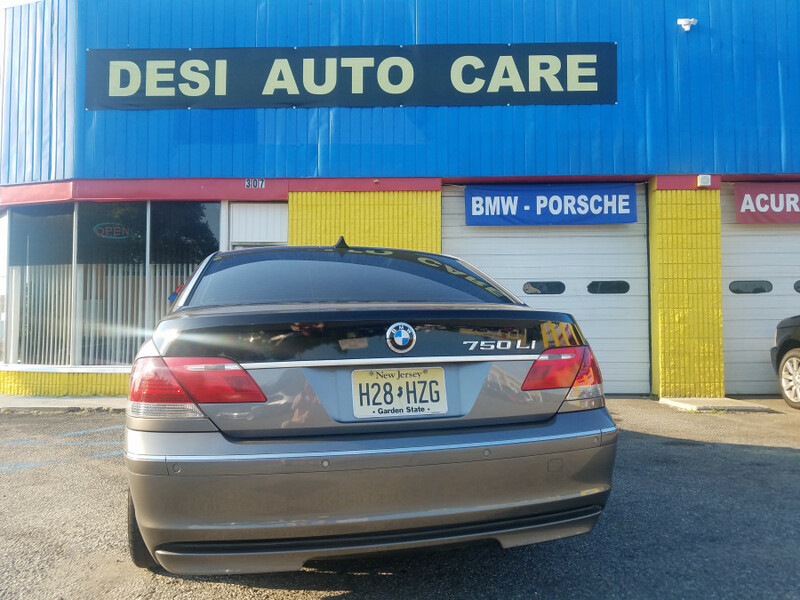 After I took my BMW to desi auto they diagnosed and repaired it in just couple hours at a very fair price which I never expected. The mechanics are very knowledgeable and experiened. Overall these people are fantastic and I would say cause of my experience this is the best place to bring in your European Vehicle. it was such a pleasure to taking care of your car. your's is one of the cleanest car we have seen. if you need any help in future, our team will be very happy to assist you. Thank you for support. As a granddaughter of reputed mechanic shop owner, I always get free auto repairs. 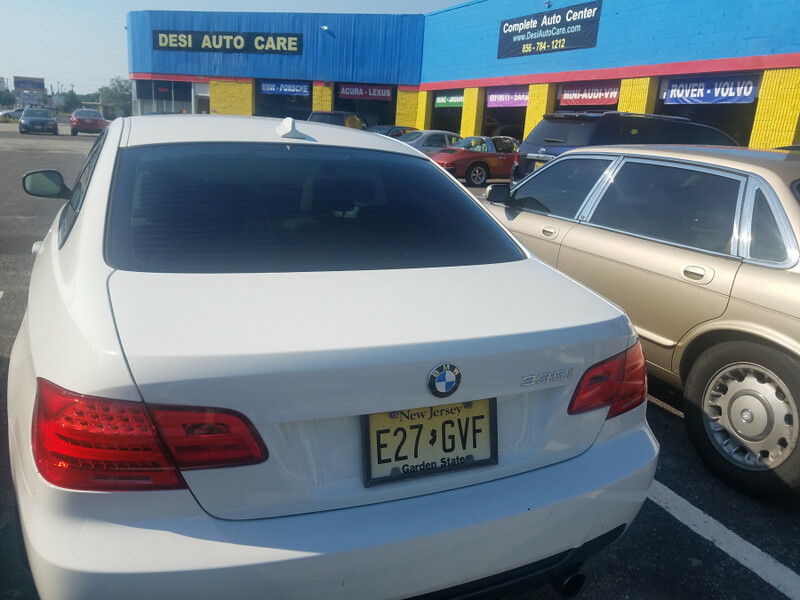 But after moving to this area it was hard to find good BMW repair shop.i found this shop through BimmerShops.com also I searched Google etc and Desi Auto Care had perfect ratings. I'm more than impress with this place and I love to support local businesses. After dropping my BMW 328i for AC and emission problems, Rachael called me with estimate. To my surprise it was VERY REASONABLE. My car fixed same day. All women should go to this shop bcoz they will not treat you like an idiot or add extras that we do not need. at the end owner gave me gift-envelop filled with amazing exotic candies and free car wash coupon. Now I'm confused, what do I love more? Candies or Shop? I guess both. We're happy that you're satisfied with our service. Thank you !